Note: This article was originally published in 2010. About 60,000 new cases of Parkinson's Disease will be diagnosed in the U.S. this year. It' s a disease that disables the movements of the people it inflicts. 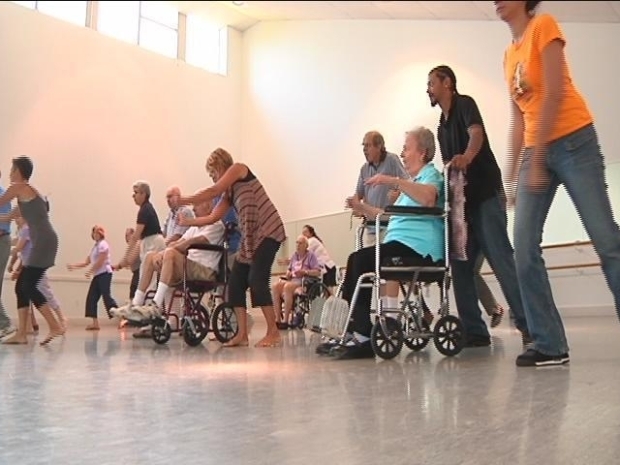 However, many patients are finding an escape in a weekly dance class offered on the campus of Connecticut College in New London. "I was pretty stiff and I couldn't do very much, I was confined to a wheel chair,’ said Billie Lieberman of East Lyme. Dance therapy helps some Parkinson's patients overcome pain and immobility. Now Lieberman is on her feet. "We find the exercise keeps us mobile, just like anyone else like a machine, if you don't run it you get rusty. so that's the same case with people with Parkinson's you tend to get stiffened up quicker,” said Philip Moore of Norwich. Each person in the class is at a different stage in the disease. Some come with caretakers, while others arrive alone. They all agree though, moving to the music is a powerful medicine. "There's something magic that happens when you do this to music. people do things they can't do just standing up in your house or at an exercise class,” said Jeff Lincoln of Guilford. Instructor, Rachel Balaban, has witnessed transformations in this class. "People get a sense of where their body is meant to be and they envision and then they put the body there,” said Balaban. Stan Werthheimer helps head the CPWT, the Parkinson's working group. He helped start this class. "When you have pd you live very much in the present so if you feel better for an hour. that's an hour of your life you feel good and it's a bonus it's a real bonus,” said Werthheimer. So even if for only an hour at a time, this program is producing results and offering rewards. "You move and you don't think about where it hurts. it's funny you can move to the music but i couldn't move if the music wasn't there and the rhythm wasn't there,” said Werthheimer.